If I was only allowed to enter one kind of shop for the rest of my life, I’d choose op shops. You can find anything in op shops or thrift shops or charity shops – whatever you may call them in your neck of the woods – although if you’re after something specific, you have to go about it subtly. Sometimes the op shop gods will smile on you and you’ll find an exact replacement for your dad’s old dictionary in the first shop you visit. Other times, they laugh at you as you search through fully a dozen op shops before you finally get your hands on a proper Scrabble game. Often, Sundays are the only weekend day when I can hunt out op shops and to find one open on such a day is a very rare event indeed. Yet that’s exactly what happened as I was driving through Chiltern with the parents last weekend. An open op shop was the very last thing we expected to discover in this historic little town in North East Victoria and yet there it was, its glorious ‘Op Shop Open’ sign begging us to come in. And look what I found! 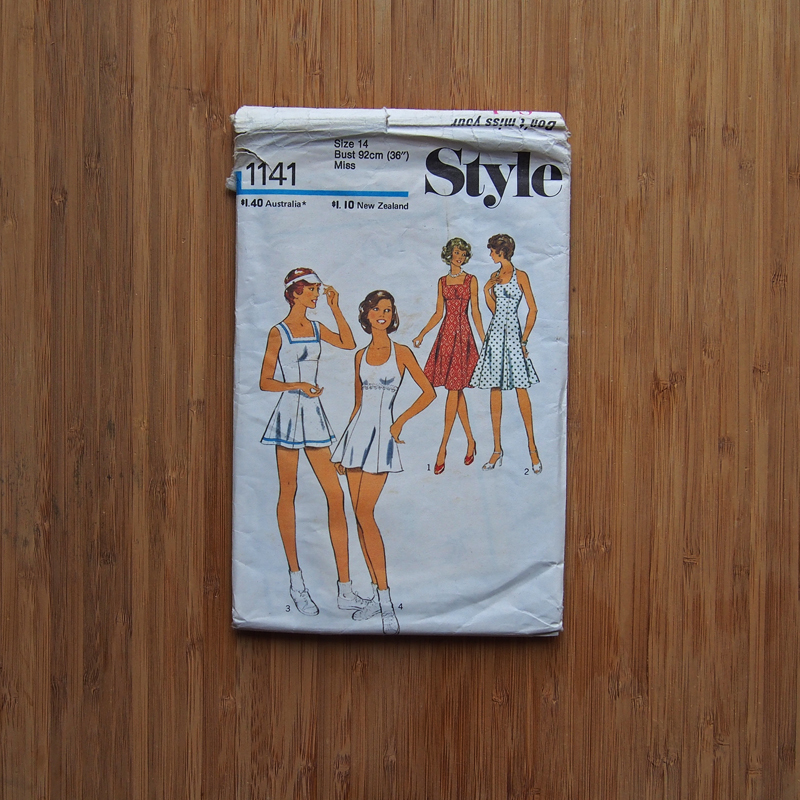 I was excited enough to discover a large box stuffed full of old sewing patterns. I was ecstatic to turn around and find two more. “We might be here for a little while,” mum said to dad, as we set about riffling through the boxes. Seven lovely patterns, many of which have never even been used. I couldn’t resist that classic seventies dress on the top there. Will I ever make it? Perhaps. I’m finding it difficult to resist those gloriously puffy sleeves. In the meantime, I just love looking at it and wondering how it might have turned out if its original owner had ever made it. Feast your eyes on the length of the dresses in the illustration, though. Either those models actually were eight foot tall or the illustrator took some serious liberties in the name of art. I love the little dress in red on the pattern above. In fact, I hadn’t even noticed the much more prominent tennis dresses until the ma pointed them out. But the garment I most want to make isn’t actually pictured on the front, for reasons that will soon become obvious. You can see it at the bottom left of the photo below. It’s a pattern for bloomers! Don’t laugh, but I’ve been seriously tempted to make some silly, frilly bloomers for when I’m riding my bike, because riding a bike in a dress isn’t always decorous as I’d like it to be. Many a day, I’ve been holding back on pedalling because the wind was being a bit too insistent in its efforts to blow my skirt over my head. This just leaves one question: Does a pair of bloomers count as a whole garment for my Delightful Dozen Project? Probably not… Perhaps I’ll make a pair to match a dress or something. Then there was this pattern below. 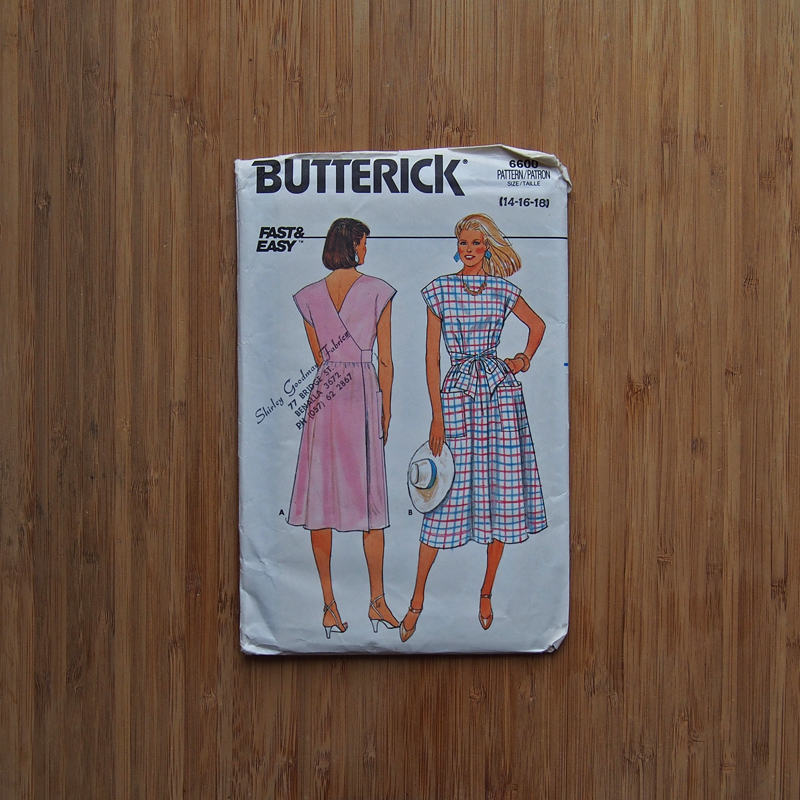 I liked it enough to put it in my pile of selected patterns, but as I investigated it more thoroughly, I realised it was a type of dress I’ve wanting to find for ages: a back wrap dress in a very simple style. 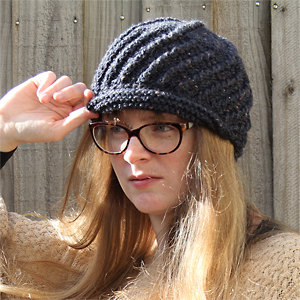 This one is definitely going on the list of patterns to make for the Delightful Dozen Project – it has such a retro 1940s feel to it that I can’t not make it. The best bit? All of these patterns, plus a roll of hemming tape, cost me $5. Yes, I think I’ll stick with op shops, thanks. Who else is with me? What awesome finds! I love op shops that sell patterns, sometimes you find ones that are just amazing and sometimes you find ones that just remind you how much fashion has changed 😛 You found some gorgeous wearable patterns and you should be so happy with them 🙂 I’m so jealous of the last one! The ones from the eighties are definitely… interesting at times. Sometimes, I find whole bunches of amazing 1980s Vogue patterns and it is pretty much shoulder pad central. I’m so happy with the wrap dress pattern! Hopefully I’ll do it justice when I finally get around to making it. They are something else, aren’t they? 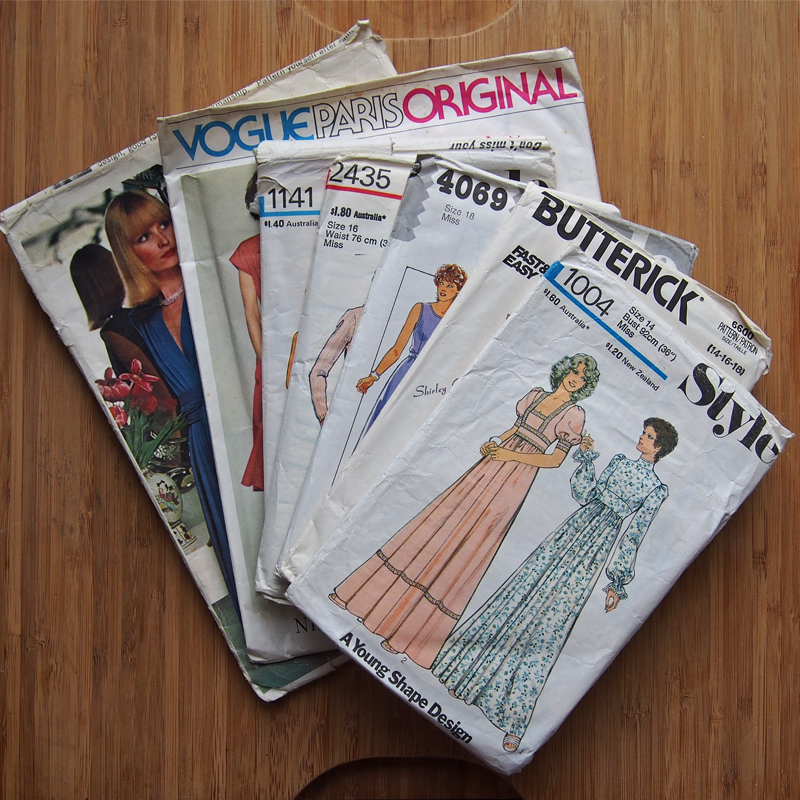 I once found an op shop with about twenty untouched 1980s Vogue patterns and wanted to adopt them all. It was rather difficult to leave them behind on the understanding that I’d just be buying them to look after them forever, rather than ever making one. I found an oscar de la renta ruffled lace, gathered bodice, giant sleeve cocktail dress that had to come home with me. It’s incredible! No way!!! One of my all-time faves. The ODLR dress pattern is quite similar to Jareth’s ruffley Lacey shirt actually. I just wish I could wear a dress, but I haven’t quite found one without appearing as if I was wearing a tent (well, apart from my slinky cocktail dresses)! Short dresses are just out of the question as I have ugly knees. Well, it works along with three-quarter pants. I like the checkered dress. It just oozes 1980’s! If I lived a little closer, I’d certainly be there all the time! It’s a bit different for my parents, though – they can be there in half an hour or so. I think you’re right about what I should make. Now I just need to go through my mini-stash and see if there’s something I can use. Oh absolutely, op shops are pretty much the only place I shop for clothes! 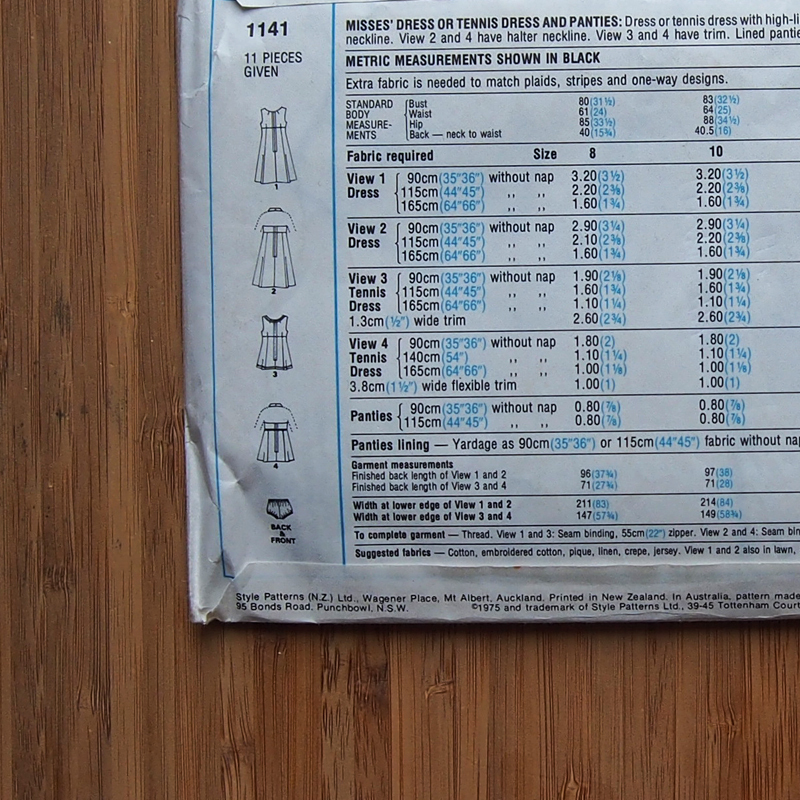 And most of my sewing patterns have come from op shops too. How rare to find one open on a Sunday, and with patterns in abundance! I happened to drive past my favourite local yesterday, and lo and behold I spotted the glorious proclamation on the window “50% off sale”. Who could possibly resist that! There’s been a small trend towards some op shops being open on Sundays, but not a lot! I honestly expected an op shop in a small country town to be shut up for the day, but how wrong I was – thankfully, so. A fifty percent off sale in an op shop is pretty much a gilt-edged personal invitation to come inside and enjoy, really. I hope you did just that! Wow. Total envy kick…your op shops rock!! I ❤ Style patterns, and I'm still not happy that they're no longer a going concern. Also, I'm impressed that you managed to keep to 7. Only 7?!? It’s great when you find a good op shop – makes up for the ones that barely have any crafty stuff at all. And yes, only seven. I would have bought more but they were in larger sizes and I wasn’t sure about re-sizing them, so I left them for someone else who would appreciate them more. Please make the puffy maxi dress. It’s amazing! It’s ridiculously tempting! I should just go and find some crazy seventies-style print and go to town on it. I only wish! Every time I look around I find either nothing or patterns that are too well used! I could just squeeze my sister though, for she cannot sew anymore and gave me two small boxes of mostly used patterns – her whole collection! I just love looking at the older style and the drawings on the front. One I am going to sew up from her patterns, she tells me, she made for her civil ceremony wedding. It was so cool to be making the same dress she wore, and I can even remember how it looked – just lovely on her! That’s a lovely story! It’s wonderful to know the story of a pattern and even better that it’s connected to you by family, too. You really do take your chances when it comes to op shops. For every amazing collection of patterns I’ve found, I’ve had to work my way through a half-dozen ordinary (or non-existent) ones. It’s wonderful when you happen upon a good one, though! Op shops are the boom-diggitty… And I ADORE country op shops with all my heart! You can always find the best stuff in country op shops that you just don’t find in the city. So everywhere I go, I’m op shopping… Always. Country op shops are my absolute favourite and this amazing find just reinforced that affection for me. You just can’t beat them! I so miss volunteering in the local op shop! Like you, if I could visit only one sort of shop for the rest of my life… (provided I could lump op and tip shops into the same group). I could definitely understand if you found yourself indefinitely detained in Norway, but huzzah for your plan to volunteer in your local op shop! They must be such fascinating places to work in.